Welcome to the 22nd annual Icebreaker Tournament in support of the US Youth Soccer's Kickback Program. The past several years has seen an average of 400 teams compete over the three weekends for the right to be crowned Icebreaker Champions. With several competitive divisions in each age group, the Icebreaker tournament will be able to find quality competition for every type of travel/select team. Club Directors interested in bringing several team should contact the Tournament Director, Jeff Broderson , as soon as possible for discounts. 11U-19U matches will all have 3 referees and one referee for 9U-10U group matches with 3 referees for semi-finals & finals. The majority of the divisions will play in beautiful Prince William County (a mere 30 miles from our nations capital, Washington DC) on our 15+ Bermuda Grass Fields and 15+ Synthetic turf fields. The Icebreaker Tournament will also be partnering with Registration Saver for Tournament & Travel Insurance for all teams. Interested teams should visit the link to learn more about how to purchase Registration Saver. 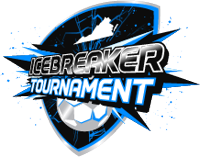 Prince William Soccer is pleased to invite all travel select teams to the 2019 Icebreaker Tournament in support of the US Soccer Foundation’s Passback Program. The Icebreaker is the largest preseason tournament on the East Coast. It is a USYSA sanctioned tournament through the Virginia Youth Soccer Association (NOTE: US Club Soccer teams are permitted to play). The tournament will be played in Prince William County in Northern Virginia. Our goal is to provide the best possible youth soccer competition for the teams entered. The tournament supports the US Soccer Foundation Passback Program. Every player is encouraged to used soccer equipment to registration or any game site for collection. At the end of the tournament, the equipment will be collected and sent to those who need it. Your kind support is greatly appreciated. Prince William Soccer is proud to be affiliated with a charitable cause with each of its three tournaments. We feel a tremendous responsibility to give back to the community through our events.